‘Ther’s tha devil movin’ in my blood’. 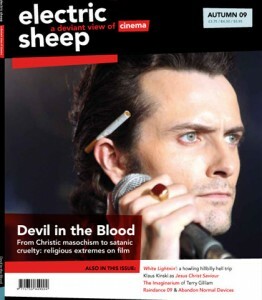 The autumn 09 issue of Electric Sheep looks at religious extremes on film from Christic masochism to satanic cruelty. 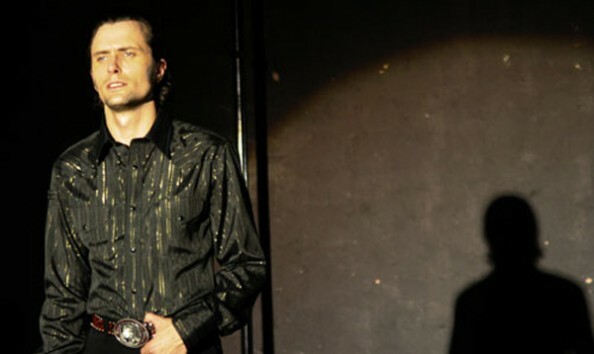 The extraordinary White Lightnin’ explores the Old Testament world of demented mountain dancer Jesco White while Klaus Kinski disastrously reinterprets the New Testament in Jesus Christ Saviour – and subversives Alejandro Jodorowsky and Kenneth Anger dynamite divine myths. The magazine is no longer available and we are no longer published by Wallflower Press. Also in this issue: Terry Gilliam’s The Imaginarium of Doctor Parnassus, Raindance 09, political animation, and louche mariachi rockabilly Dan Sartain picks his top films! In an interview recorded at the Cine-Excess film festival in London, Alex Fitch talks to Italian cult filmmaker Dario Argento about his career from writing ‘Spaghetti Westerns’ scripts in the 1960s such as Once Upon a time in the West to his most recent film Mother of Tears. Argento talks about the importance of music in his work, why he doesn’t like being pigeon-holed as a horror director and his new project Giallo. Listen to the podcast of the Dario Argento interview + Goblin Q&A led by Alex Fitch at the Supersonic music festival in Birmingham. Alex Fitch talks to the Italian prog rock band Goblin – Fabio Pignatelli, Massimo Morante, Agostino Marangolo and Maurizio Guarini – about scoring Argento’s films from Profondo Rosso (Deep Red) to Non ho sonno (Sleepless). A dark, surreal semi-biopic about glue-sniffing, hard-drinking, hell-raising Appalachian mountain dancer Jesco White (impressively played by newcomer Ed Hogg), British director Dominic Murphy’s controversial debut feature takes us deeper and deeper into Jesco’s crazed visions and wild religious fantasies, culminating in horrific revenge and violent redemption. We are delighted to welcome Dominic Murphy for a Q&A after the screening. With thanks to Momentum Pictures. White Lightnin’ starts its theatrical run at the ICA and Rich Mix (Bethnal Green), London, on September 25.